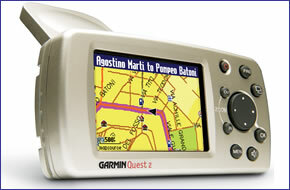 Garmin Quest 2 GPS system is pre-loaded with mapping for all of Europe. The Garmin Quest 2 satellite navigation system features auto-routable, turn-by-turn, voice-prompted navigation with automatic off-route and detour recalculation. Garmin Quest 2 has been discontinued. Released in 2017, the replacement and equalivent model to the Garmin Quest 2 is the Garmin GPSMAP 276Cx. The Garmin Quest 2 navigation system has a brilliant 256-color backlit TFT display making it easy to read in any light. Furthermore the Garmin Quest 2 is waterproof and has a rechargeable internal lithium-ion battery that provides up to 20 hours of use and an A/C charger. The Garmin Quest 2 comes pre-loaded with European maps-including nearly six million points of interest like gas stations, ATMs, hotels, restaurants, and attractions. The Garmin Quest 2 also accepts optional MapSource cartography like Recreational Lakes with Fishing Hot Spots, and BlueChart. As an added benefit, you can now import customised points of interest with the help of Garmin's free POI Loader software. The possibilities are endless - download speed camera databases or school zones, and you will receive a warning if you are traveling too fast. In addition, an optional proximity-alert feature notifies you of upcoming custom POIs. The Garmin Quest 2 has been designed to be a fully portable navigation system, and as such can be transferred from vehicle to vehicle with ease by the user. The Garmin Quest 2 can be powered using the external speaker with 12-24 volt adapter cable. Built-in Li-ion batteries will allow for handheld operation. In addition the Garmin GPS Quest 2 can also be powered by the provided mains A/C power adaptor for use in the home or office, when updating map detail or configuring a route. The Garmin Quest 2 vehicle suction cup mount allows an easy installation. The built-in speaker provides voice guidance.